« Mom didn’t know the significance! As you kno w, I fly US Airways… A LOT. As a novice in the world of frequent flyers over the last year I’ve learned a lot. I just barely missed Silver Status at the end of last year and I really could have used it at the beginning of this year. This year, I’ve had many issues with the way US Airways labels some of its flights and thus count the segments. US Airways has some flights from El Paso to San Luis Obispo or Bakersfield (Or vice versa) that are listed as one flight, this counting as 1 flight segment. This really makes me angry because every time you buy a ticket it says you are buying a flight that stops in Phoenix, but you don’t change planes. This is almost never true. This past year I found my self in this situation 18 times, and on 17 of those times I did I change planes, (And of course did still have to deplane on the one time I got back on the same plane) and on 12 of those times I changed concourses (not just gates). Anyway, this is just one of my pet peeves. If I actually got credit for a segment every time I had to change planes en route to my destination I would have hit Platinum status in October or early November. As it was, I was going to find myself 4 segments short. I had to decide if getting two extra segments was going to be worth the difference in flying as a Gold Member or Platinum Member next year. After weighing my options, I decided it was going to be worth it to get the extra segments. That all being said, here is the tale of the extra trip I decided to take to do something fun and irresponsible with a few hundred dollars of money in my “Blow” account (Money I can just blow from our budget – my woman and I both get to do this). So how would I blow money? Going to a concert of course!!! Rather than bore you with the details of all the planning and strategizing I went through I’ll just tell you how it worked out. Friday I decided to pack only a change of underwear, socks and a shirt. Stuffing a pair of jeans into my laptop back is a little inconvenient. Then I ended up working outside in a big rainstorm at work. (Yes, my fellow IT professionals – It could happen to you one day!) Luckily they didn’t end up too muddy. But it was the first hint things might not work out as perfectly as I had hoped. Anyway, I flew out of Bakersfield an hour late, but since there is a about 20 minutes of buffer built into the schedule we only ended up 30 minutes late and I didn’t have any trouble making my connection to exotic Yuma, Arizona! A mile and a half of construction zones and areas without sidewalks along the I-8 business loop through town, I made it to the hotel. The hotel was a Ramada Inn. Kind of a dump and it had better reviews on the hotels.com website than it deserves (I’m going to do only my second ever hotel review to help remedy that), but it’s my 10th night at Hotels.com so I’ve finally earned my free night, and it was only $42. The crazy thing is, is that I only used the room for less than 6 hours – so I still paid over $7 and hour to use the room and over $10 an hour to sleep. Yup, I got to sleep less than 4 hours. I hate when these things happen. I was hot and sweaty when I got there, so I watched an episode of “The Closer” (I’m on season 6) to mellow out before setting my alarm to go to bed. When I went to set it, I found that my stupid iphone was on the wrong time zone (Although it was correct when I arrived at the hotel). So I set the alarm for an hour early just in case the phone stayed on the wrong time zone. I proceeded to wake up every half an hour or so fearing (irrationally, as I am wont to do) that I was going to not wake up on time. Well, the iphone did change back to the proper time zone and woke me up an hour early. I reset my alarm, then, just in case, I also set the alarm on my other phone, and dozed off and on for an hour, getting up 5 minutes before the alarms went off. Yes, this kind of thing happens to me all of the time… this is my life. Just giving you an inside peek. Anyway, I got to the airport at about 6:20AM and went to try and do a move up. It’s funny, I think the guy I was dealing with had never done a move up, and he was kind of nervous about trying it. He tried to say he couldn’t because the flight was full, but actually when you “move up” it’s designed for people to get on the standby list. In the end he called someone and they walked him through it. In the end they decided there was a seat available and I wouldn’t have had to be on standby. But I wasn’t assigned a seat because the Yuma airport is so low tech. Once they started boarding, (rather than getting on first, like usual) I had to wait until everyone else had boarded to make sure there was a seat for me. So I got the last seat on the plane and I was off to Phoenix only 9 hours after I had left in the first place. I called The Illustrator and told her I’d be there early, so we made a breakfast date. Then – off to Water and Ice! Blackberry and Raspberry with Cream! YAY!!! The original plan was to buy a medium priced used car for me then have Steven drive the Explorer at college until it died. I was looking around, but I couldn’t really find a car/SUV that I liked. The SUVs these days are more like station wagons or small mini-vans so I ended up finding a 2002 Mercury Mountaineer. It has low miles and is going to hopefully be really great. It was less than I intended to spend so I was really happy about that. Unfortunately the power steering on the Explorer took a dump within a day of buying my new used car. It was going to cost a fortune to fix it, so… It’s gone. Anyway, The Illustrator and I went looking for a really cheap car (to spend the money I saved when I bought my car). We are so blessed that I got such a cheap car for me, so hopefully we have enough to get two cheap cars with the money we saved to buy my car. We had little success, but actually did find a little green Hyundai that we still might get if it runs okay and is cheap enough. The only thing is, that my woman trusted me and The Illustrator to pick it out on Saturday, but today, she doesn’t, so… who knows? After the car shopping trip I got to see The Illustrator’s new apartment/house. It seems nice. It sounds like she’s having fun with her new roommates. Then it was off to Glendale. We left really early in case the parking situation was really horrific, but it wasn’t too bad. We were going to see a movie before the concert, but there wasn’t one conveniently timed. In the end that was fine too. 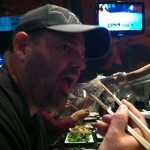 We went to the Kabuki Japanese Restaurant. It was packed. We think there were 2 “The Dad – Party of 2” on the list and that we stole someones place in line, but maybe not :). 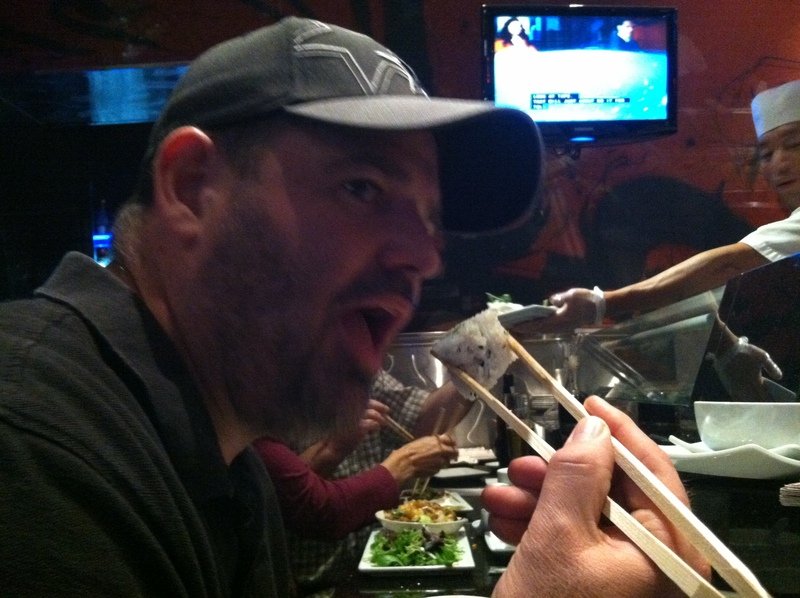 The food was great and I even ate a little sushi (even though one was just a California Roll – which I guess is the wimpiest of all sushi). We were able to be leisurely and enjoy ourselves. We waited until the line to get into the arena had died down so we barely waited a minute or so to get in. Then we found our seats (walking 80% of the way around the arena – should have turned left instead). 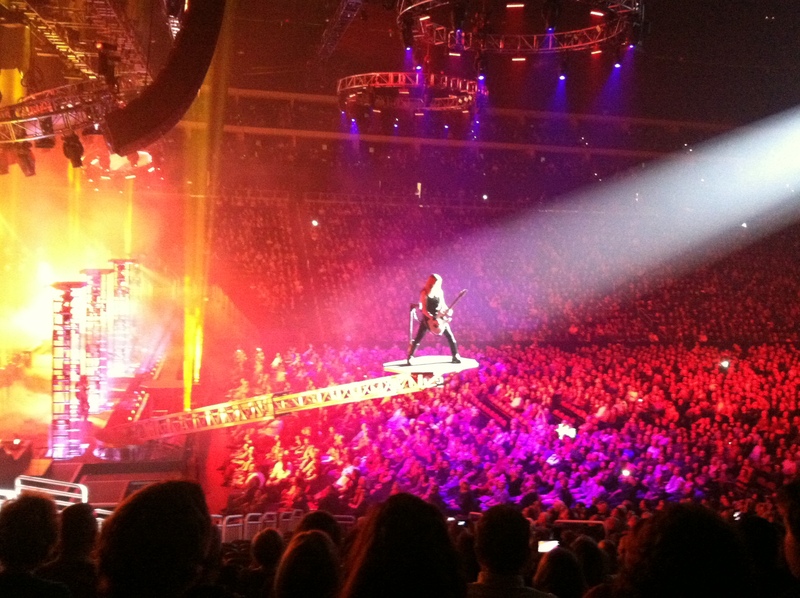 So, I ha ven’t even mentioned to purpose of the whole excursion … Trans-Siberian Orchestra. They have a brand new Christmas show this year. It was awesome! I bawled! That’s just how I roll when the Spirit talks to me. 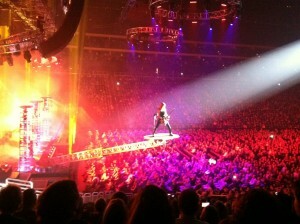 My review of the concert will be on my music blog as soon as possible, So I’ll skip that here. The only thing I’ll say was that I had a pretty bad headache and nothing to take for it. But even with that, I loved it! After the show The Illustrator and I headed off to try and find some aspirin or ibuprofen or something for m y headache. 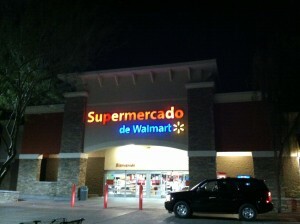 We arrived at the Supermercado de Walmart just as they closed. We then headed to the airport. My plan was a naive one. I would just sleep at the airport at the US Airways club. I figured it would have better chairs and be a nicer environment. What I didn’t count on was that it would be closed until 6AM. The seating outside of the gate areas is apparently designed to discourage laying down, this was also unexpected. So the next 5+ hours were ugly as I tried to at least get a couple hours of sleep, a few minutes at a time. Without boring you with all of the details, finally 6AM rolled around and I did finally did get to go to the US Airways club. I had a free day pass, and I figured this was the only time I’d actually have more than an hour or so to use it. The lady at the counter was really nice and actually comped me another pass, so – that was great! The club area was nice and quiet, but the chairs were only slightly better and obviously not designed for sleeping either, but I was tired enough to finally get almost an hour and half of sleep. Well, the rest of the trip was pretty mundane – at least I was able to fly First class and slept most of the trip to Bakersfield. In the end it was long, tiring and super fun. I enjoyed doing something outside of the ordinary for once. I hope The Illustrator had fun spending the day with her OLD Dad.